Greetings from Northeastern Japan. 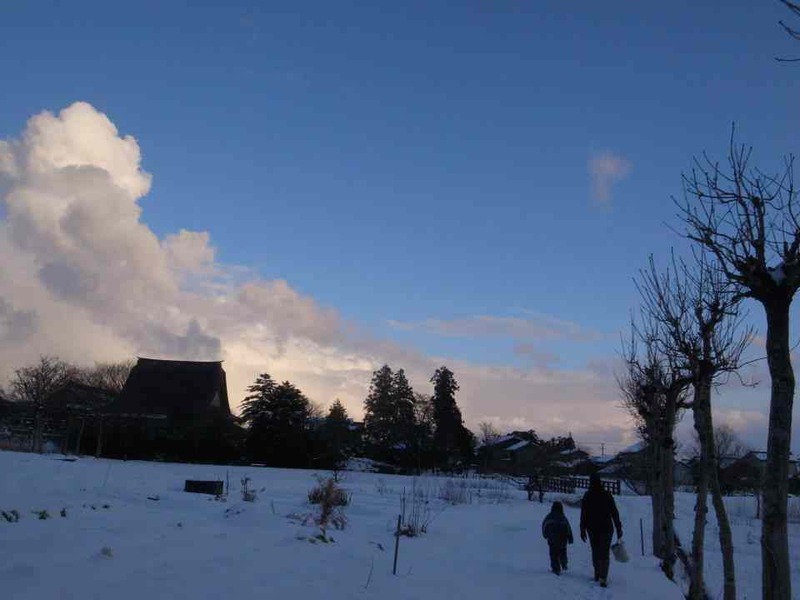 A while back, I contacted Cold House Journal after waking up one morning to a brisk 48˚ in the living room of the Japanese house I share with my husband and five-year-old son (since then we’ve gone as low as 38˚ — but who’s counting, anyway…). Having grown up in New Hampshire and Vermont, I am a pretty hearty person and I don’t generally need to be super-heated, but I must admit I freaked out just a bit as the temperatures here started dropping. So I contacted CHJ to ask if I should worry about slipping into a hypothermic coma in my sleep…the calm and reassuring “no” that came back in response to my query inspired me to begin to think about my own cold house and the ways in which I respond to it, emotionally and physically. The house we rent is thoroughly and unabashedly un-insulated and un-heated. The windows, which are abundant in every room, are single-glazed to allow maximum cold penetration. Looking up at the ceiling inside a dark closet, I can see little strips of light where gaps in the roofing allow the sunlight to penetrate. 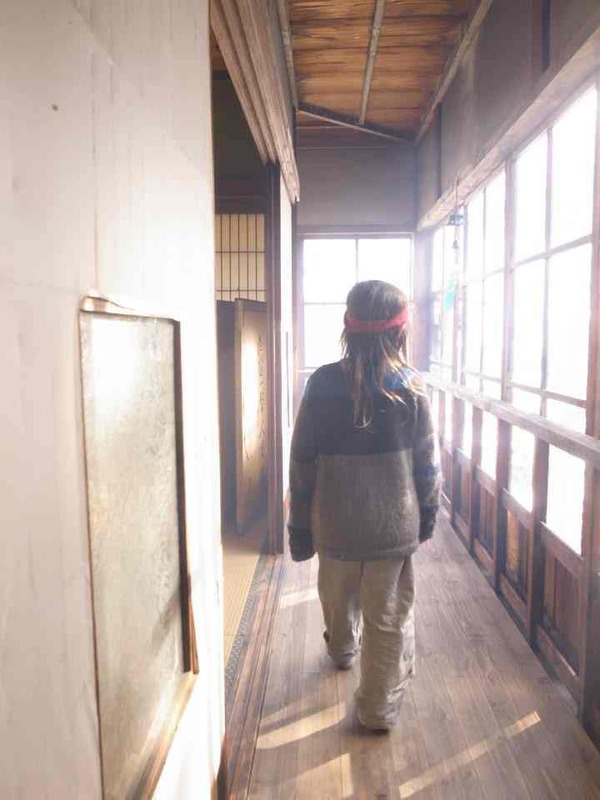 The paper shoji screens which cover most of the windows and serve as doors between rooms, rustle when the wind blows. Cold drafts of air shoot into the room when any curtain or door is opened. It’s really cold in here. As a first cold-fighting measure, we’ve applied some “special” bubble wrap for insulating otherwise un-insulated glass [ed. note: we have used this strategy too]. It looks like regular bubble wrap except that the coating on one side is slightly slack, creating many little suction cup bubbles. These adhere nicely to the surface of the window because there is so much condensation on the glass and no central heat to dry things out. A month after putting it up in the bedroom and living room, it’s still plastered on the glass perfectly. I’ve also gone around and locked every window, which makes a surprisingly big difference in sealing out the drafts (duh!). Other than that, we’ve just trained ourselves: Dress in warm layers, always wear socks, time the bedtime preparations so that the hot water bottles are ready when we are, hot shower just before bed, a thermos of hot water always at the ready for warming up dinner plates and coffee mugs, etc etc. It’s a long list. In fact, it grows longer each day. But I think we’re all stronger and more resilient as a result. And this is a good thing. It helps that we live within walking distance of a nice hot spring bath house (an onsen), where, for about $20 a head, we can spend the day soaking, eating and relaxing, spa towel and Japanese lounge-wear included. This is the view, walking home from a warm day at the baths. It also helps that our house is well suited for the use of localized heat sources. Each room can be closed off by a sliding door (the aforementioned shoji screen) which consists of a wood frame, with glass on the lower half and paper on the top half (or all paper in some cases). This imperfect seal provides enough of a barrier to hold in the heat generated by a small kerosene heater, but allows fresh air in so we don’t all suffocate on carbon monoxide. Good Japanese design at work here, although most effective when not poked full of holes by a five-year-old. In the above photos, you can see the inner doors are opened, and beyond them, a narrow hallway, also with sliding doors, that opens to the outside. This idea of inner rooms, surrounded by a passageway or veranda, is very common in Japanese architecture, and helps create inner spaces that feel cozy and protected from the elements, while allowing air to circulate through the house as needed. 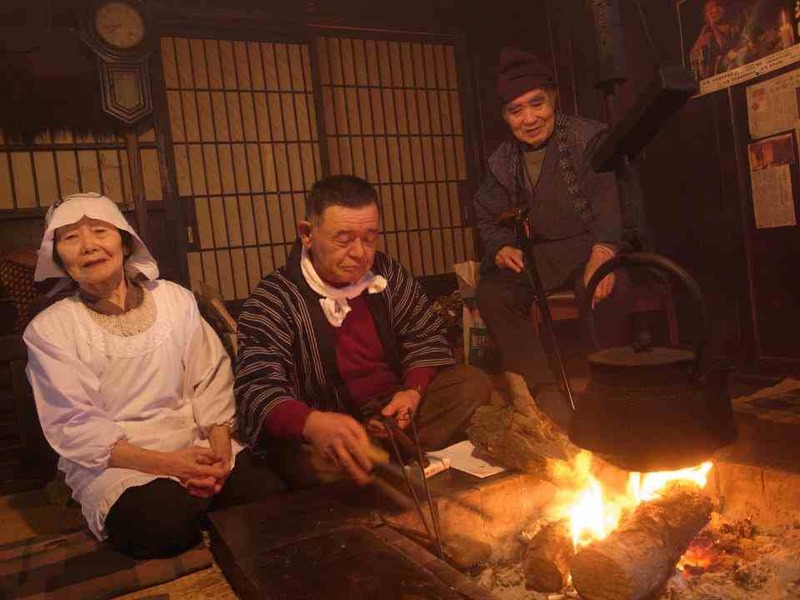 From what I understand, the same principle of “breathable” home spaces was important in the “old days” when Japanese homes were heated by an irori in the center of the main room. The irori, a square fire pit built right into the floor, is vented only by a small opening in the roof above it. There is no chimney to speak of. 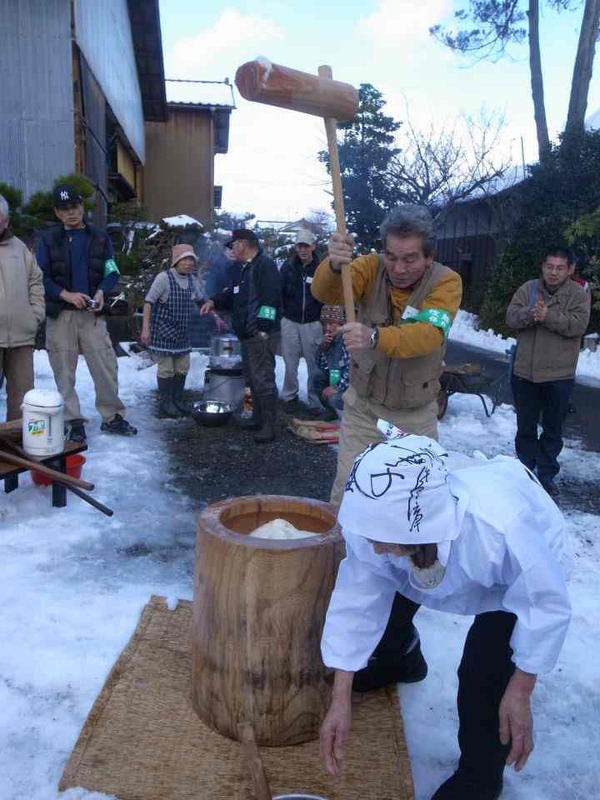 Traditionally, families would gather around the irori for cooking, warmth, and community. As the only heat source, it was, in essence, the heart of the home. There is lovely irori in our village, in an old farmhouse which has been preserved as a historic landmark. Here are some of the town elders, enjoying the smoky heat. After spending a day at this house recently, we all smelled of cedar and sandalwood – kind of nice! 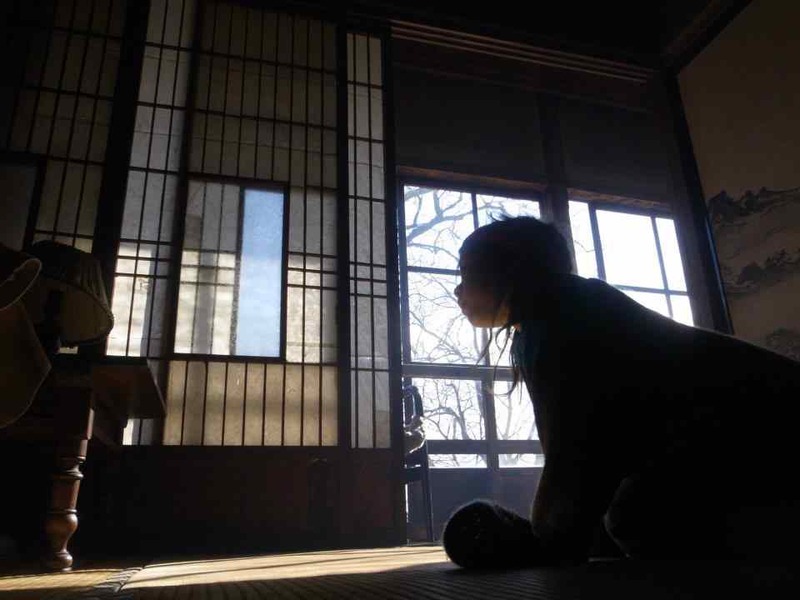 The main room of OUR house, where we spend most waking hours, is the zashiki, or formal living room. It’s heated not by an irori, but rather, by a Mitsubishi kerosene heater with a built-in fan. This is, presently, the only heater in use in our house. Now that we’ve had outdoor temperatures hovering around 0˚ Celsius for a week, we’ve been running the heater a lot more. One 4-liter tank of kerosene seems to last us about two days one day, a duration which, considering the temperatures and the fuel cost estimates we got from friends and relatives, seems pretty good. Technically, the zashiki is the room where guests are received, tea is served, and the ancestral shrine is kept and worshipped. In our case, it’s the everything room (expect for the shrine worship, since it’s not our house and not our ancestors). When guests show up, there is a big flurry of activity as we quickly clear away all the laundry that we’ve hung up to dry and hide away toys, papers, computers and other messes. It’s basically the room where everything happens, so it gets kind of messy. We lay out clothes here in the morning before getting dressed so they get nice and toasty. Next to the zashiki is a similarly-sized room with a small kotatsu on a hotto kaapetto (aka “hot carpet”). We’ve had to improvise on the kotatsu table top, so it’s not that pretty, but it’s warm, and that’s all that matters at this point. Too small for a family meal, our kotatsu is basically a small table with a heat lamp built into the bottom of it. We sit there to use the computer, knit, watch movies, build lego, hang out, etc. The five year-old in my life is small enough to crawl under the kotatsu blanket and hang out where it’s really warm. Likewise, I’m big enough to insist that he curl up next to my feet and keep them snuggly warm while he’s there! Another aspect of this home which works well in the cold is the tatami flooring. 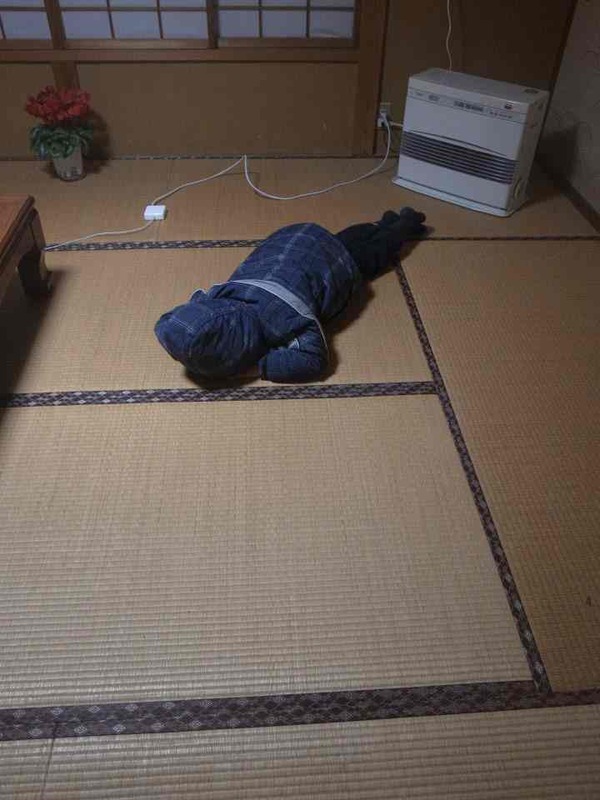 Every room in the house, except the kitchen, toilet, bath, and hallways, is covered with thick straw tatami mats. Rooms are categorized by how many mats they consist of. Our zashiki, for example, the largest room in the house, is a standard size 10-mat room (about 12’ x 14’). The tatami makes sitting on the floor, which is what one does in Japanese houses, a comfortable and slightly more cozy affair. The addition of a kotatsu and/or hotto kaapetto makes things downright toasty. When we have to move from one tatami room to another, to go to the kitchen, for example, we wear slippers. This means sliding open the shoji, slipping into hall slippers, closing the shoji behind you, walking down the hall, opening the shoji to the kitchen, getting what you need, and then repeating all in reverse orders. A lot to do for a cup of coffee, but it becomes second nature pretty quickly. While I can’t imagine many folks in the US making time in their daily routines for slipping in and out of shoes or slippers dozens of times a day, and opening and closing doors constantly to help regulate individual room temperatures, these kinds of cumbersome little details are second nature for most Japanese people I know. In fact, I feel like it’s attention to the small details that make living this way possible at all. On that note, I’m reminded of the third, and to me, most significant, thing that makes this house suited to the cold: We’re not alone! All the other houses around us are designed and built in much the same way. They suffer the same coldness, and their inhabitants rely on many of the same tools and tricks to stay toasty. We are not out here in the cold wilderness, suffering in solitude while others enjoy short sleeves and bare feet in tropical indoor temperatures. We are, in fact, participants in normal Japanese winter life. To me, this makes all the difference. Basically, it’s cold here but people are patient and resilient. And no one seems to think it should be otherwise. The grannies in our small village are still at work outdoors, in mid-winter. I watch them each day, hanging up laundry to dry, washing and pickling vegetables, preparing foods for winter storage, working on the compost or tilling the garden beds (or now, since I started writing this and winter has really arrive, shoveling snow…). The local onsen is bustling. All the home stores have hot water bottles, slippers, heaters and kotatsu (AND the special window bubble wrap) for sale. And everyone agrees that it’s sugoku samui – really cold. This entry was posted on January 9, 2012 at 9:08 pm and is filed under Guest Posts, Stragegies. You can follow any responses to this entry through the RSS 2.0 feed. You can leave a response, or trackback from your own site. Wow! Brava! What great writing and a wonderful insight into the Japanese lifestyle! Now I want HER to write a blog continuing to lay out their adaptations and way of living in cold Japan. It sounds most fascinating… hearty and wholesome. Fantastic post! Thanks for sharing. Impressive. Great Post. I need to rethink my heartiness/ ability to withstand the cold. I had the heat completey off for 4 days and last night it got down to 48 F in the house and I turned on the heat. Couldn’t do that in Japan. Terrific article, Michelle! That’s very interesting and educational. I love hearing about your life in Japan. There’ some miso paste in the fridge and lots of dark green leafy veg in the cold frame. Time to start eating miso soup for breakfast and daydream about wood burning bathtubs. Lived in Japan as a child and it was wonderful to read your description of the house and the shoji screens especially. I have fond memories of poking holes in them….and getting in lots of trouble for it! Can still remember the smoky smells and the old grannies knitting. Beautifully written, thank you.